We are grateful for donations of any amount that will help us in our efforts to protect the vibrancy and heritage that belongs to our neighborhood and the Capital City of St. Paul! If you prefer to make a donation offline (via check) please contact us using the message link on the right. Offline donation will be added to the total raised (anonymously if preferred) and deposited into the same account. With your support, our efforts so far have been successful! We commissioned a historic designation study that was submitted to the St. Paul Heritage Preservation Commission, which determined, by an overwhelming 8-1 vote, that St. Andrew's is eligible as a local heritage preservation site. The next step in local designation is a vote by St. Paul City Council, expected in early March. We have also submitted a nomination for the National Register of Historic Places and await their response. An important part of historic preservation is to show that buildings can be adapted and reused for new purposes. We believe that the leadership of the German Immersion School has failed to adequately address reuse options, so we are now commissioning an adaptive reuse study. We are in discussion with MacDonald & Mack Architects to begin such a study soon and an initial cost estimate is $10,000. This architecture firm is one of the premier historic preservation groups in the Twin Cities, and we are pleased to be working with them on this project! We will need donations, however, to support this essential part of the process. Meanwhile, the Twin Cities German Immersion School building plan is proceeding through the city approval process. Their plan has predictably met several hurdles, stemming from having a large commuter school squeezed into a small residential site. City policy and state statute clearly indicate that the school's plan should not be approved. Thus, a lot of our efforts have been focused on opposing the approval of the school's expansion plan. After an astonishing violation of the rules on their first vote, the Planning Commission will need to re-do their vote on the plan on Feb. 8th. We may then need to file a appeal to the City Council if the Planning Commission approves the school's plan, at an unfortunate cost to us of $900. Funds raised in this second round will be used to offset our costs for for the reuse study, the city appeals process, mailings, and events we will be hosting in the coming weeks. Who are we? Save Historic St. Andrew's (SHSA) is a neighborhood coalition focused on the preservation of the historic and residential character of the Warrendale neighborhood (est. 1885), located adjacent to the well-known Como Park in St. Paul, Minnesota. We formed in April 2018 in response to the news that the former St. Andrew's church could be facing demolition. The parish moved from the church in 2011, but the site remains as a community anchor and is a significant part of St. Paul's cultural and architectural heritage. The current tenant of the site, The Twin Cities German Immersion School, plans to most likely demolish the former church in order to meet the needs of their growing school. We are working with the school to find alternative solutions but we nonetheless now recognize the need to work to protect our local history. Why raise money? 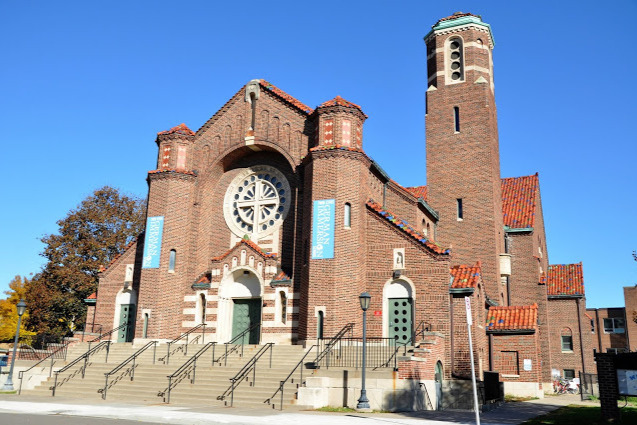 We are raising money to support our efforts in protecting the heritage and residential quality of the historic Warrendale neighborhood, and the former St. Andrew's church is central to that mission. The primary focus of our fundraising at the moment is to begin the official process of nominating the St. Andrew's church building as a historic site under St. Paul's Heritage Preservation Commission. This work must be completed by a qualified local Heritage Preservation Specialist. The school's proposed building project must be approved by the city of St. Paul and sites that are under review for heritage preservation would be much less likely to be approved for demolition. Thus, beginning this nomination process is a key step in protecting the beautiful site from irreversible loss. The design of the St. Andrew’s church building was done by a small pool of prominent 1920’s Twin Cities architects. A history and check ledger, of the St. Andrew’s parish lists Charles Hausler as the architect of the church. Hausler was St. Paul’s first City architect (1914-22) and apprenticed under Clarence Johnston, Harry Wild Jones, and Louis Sullivan. Six of Hauser’s buildings are now on the National Register of Historic Places. Larry Millett’s AIA Guide to the Twin Cities attributes the design to either Slifer & Abrahamson or John W. Wheeler. 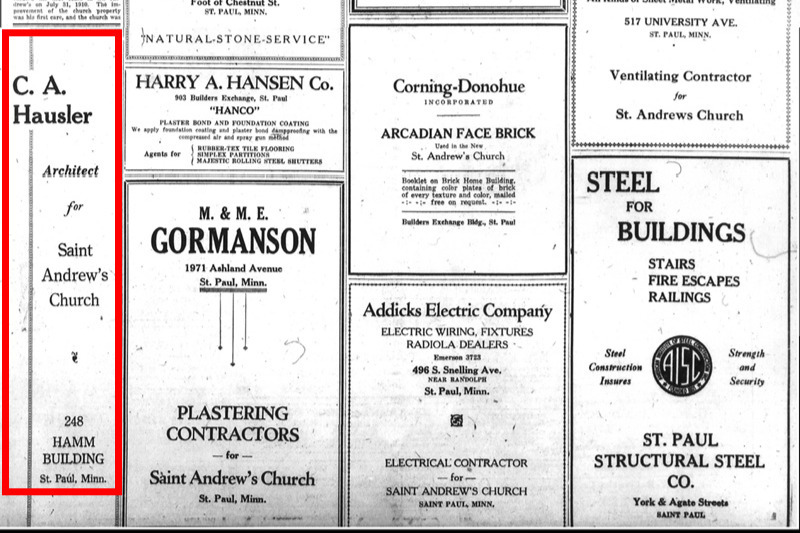 Slifer & Abrahamson worked for Emmanuel Masqeray on the iconic St. Paul Cathedral, Minneapolis St. Mary’s Cathedral, and other buildings also listed on the National Register. John Wheeler, a well-known Catholic architect, did work for St. Andrew’s and has eleven listings in the AIA Guide to the Twin Cities. All of these architects were active at the time and were designing legacy civic or church buildings in Minnesota; as such, all would likely have been in the running for a commission like St. Andrew's. How the funds are being used. After receiving numerous recommendations from professionals in the field of historic preservation, we have hired a highly qualified team to complete the historic designation study, led by Architectural Historian Rolf Anderson. The estimated cost for Phase I and II of the process is $6400. Additional funds raised are being used to cover our costs for lawn signs, mailings, and hosting of public events. Funds are being withdrawn to a dedicated bank account for Save Historic St. Andrew's and are distributed directly to those hired by SHSA or members of SHSA who have incurred a cost for items listed above. Anna Mosser, creator of this GoFundMe campaign on behalf of Save Historic St. Andrew's, is responsible for withdrawing and distributing the funds from the dedicated bank account. Funds that remain unused after our efforts are completed will be refunded to donors on a pro rata basis. Two pieces of great news to share on our campaign to Save Historic St. Andrew's! First, we have engaged a highly qualified and well-recommended team to do the historic designation survey. This work will be led by Rolf Anderson, with assistance from Robert Roscoe and Marilyn Chiat. Anderson is an architectural historian and program chair for the Minnesota Chapter of the Society of Architectural Historians. Roscoe is a preservation-focused architect who served for twenty-one years on the Minneapolis Heritage Preservation Commission. He has authored several books, including an account of preserving the historic homes of Milwaukee Avenue in Minneapolis and Legacies of Faith: The Catholic Churches of Stearns County. Chiat is a historical consultant and currently a board member of Friends of B'nai Abraham, the only synagogue structure in Minnesota to be listed on the National Register of Historic Places. Second, we have found definitive proof that Charles A. Hausler was the architect of the St. Andrew's church. A news article from the December 3, 1927, edition of the Catholic Bulletin clearly identifies Hausler as the architect. Hausler has contributed significantly to the architectural character of St. Paul and six of his building are listed on the National Register. Thank you once again for all the support. We believe that preserving our past is a crucial part of a vibrant future and is well worth the effort it requires! We've raised over $3000 in our first 36 hours. Thank you to all who have made donations. Please share far and wide to spread the word and help collect more funds for our goal. Thank you! !